Chanderi, situated in the Ashok Nagar district of Madhya Pradesh is a destination famous for its historical significance. Chanderi enjoys an advantageous location on the borders of Bundelkhand and Malwa. The town presents a delightful sight through its historical monuments and natural wonders. Wrapped in a blanket of greenery of the adjoining forests and placid lakes, the town of Chanderi is located on the lush Vindhya hills. Here is a guide to this serene town. Chanderi Fort is the most renowned monument of Chanderi. The fort stands proudly at a height of 71 mt above the town on a hill. The fort is fortified with a 5 km long wall. This important attraction of Chanderi tourism was built by King Kirti Pal in the 11th century. The fort has witnessed several attacks and has been re-built a number of times. It has three gates for entrance. The uppermost gate is known as Hawa Paur, and the lowermost gate is known as Khooni Darwaza. The southwest side of the fort has an interesting gateway called the Katti-Ghatti. Travellers coming here can explore the fort and admire the beauty of it. Koshak Mahal is an impressive palace standing at a distance of 4 km from Chanderi. The palace was built by the Sultan of Malwa, Mehmood Shah Khilji, in 1445. It was constructed as a monument to mark the victory of Mehmood Shah in the battle at Kalpi over Sultan Mehmood Sharki. The Koshak Mahal is a square structure with large impressive arched doorways. The palace consists of four mansions of similar size and equally spaced from one another. A network of passages and overhead covered corridors connect them. The superstructure of the palace does not exist today, but the beauty of the palace can still be felt in the remaining portion standing there. Koshak Mahal was constructed from white local sandstone. All the four mansions of the palace feature identical style of architecture and design. The palace today stands with three complete storeys and an incomplete fourth storey. Badal Mahal Darwaza is basically a singular structure of a gate that doesn't lead to any palace or mahal. This historic gate enjoys a central location in Chanderi, near the Jama Masjid. This imposing gate was constructed by the Sultan Mehmood Shah Khilji, the King of Malwa, in the 15th century. 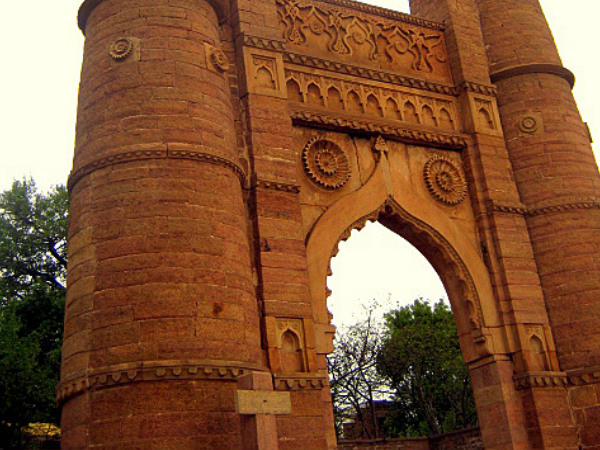 Badal Mahal Darwaza has a height of 100 ft. The structure features elaborate carvings and impressive motifs. The top of the gate features an arched design and two tall minarets stand guard on both sides. The specialty of the structural design is that a gap exists above the arched top of the gate, which is followed by another arch, which brings up the end of the gate. This gate served the purpose of welcoming and honouring the state guests and visiting kings in a grand manner. Parameshwar Tal is a spectacular water body with a serene atmosphere. The water tank is located at a distance of half a mile from the historical city of Chanderi. The beautiful tank was constructed by the Bundela Rajput Kings. On the banks of the tank is a picturesque temple dedicated to the Hindu deity Laxman. The temple is an impressive piece of architecture with well-carved features. The temple was built by the Bundela King Anirudha Singh in the 18th century and stands witness to the glorious architectural progress of those days. Several memorials also dot the banks of Parameshwar Tal. These memorials were built to honour the Rajput kings. The stunning view of the Parameshwar Tal attracts tourists from all over the country to visit this beautiful and calm place. By Air: The nearest airports to Chanderi are located at Bhopal (258 km) and Gwalior (259 km). The Raja Bhoj Airport at Bhopal is an international airport while the Rajmata Vijaya Raje Scindia Air Terminal at Gwalior is a national terminal. By Rail: The nearest railway stations to Chanderi are located at Lalitpur (36 km) and Jhansi (124 km). Ashok Nagar (63 km) and Mungaoli (38 km) also connect Chanderi to the rest of the country through the rail network. By Road: Chanderi is well connected by buses to major towns and cities in Madhya Pradesh. Bus services at are available from other major places such as Gwalior, Bhopal Indore, Guna, Vidisha, Shivpuri, Sanchi, Ashok Nagar, Tikamgarh, Jhansi and Lalitpur at regular inetrvals.